Many importers, even those new to the business, have heard of the twice-yearly Canton Fair in Guangzhou. But less well known is Yiwu, a city home to the largest wholesale market in the world. This market contains nearly 40,000 shops wholesaling nearly every commodity you can think of. One of the best things about it is that they can accommodate very low order sizes – just one or two cartons is completely normal (try requesting that at the Canton Fair!). I’ve always wanted to visit Yiwu and with a couple days free while in Shanghai I decided to check out the infamous Yiwu. Yiwu is about 2 hours west of Shanghai (1:44 to be exact on the new high speed train from Shanghai- see the bottom of the page for exact details about how to get here). It is what is described as a “Tier 4” city meaning it’s basically one of the smallest types of cities possible in China with just over a million people. The moment I stepped off the train into a North Korea-esque train station (a big change from the super modern Hongqiao station in Shanghai) and got stopped by a police officer (along with any non-Han Chinese looking person) to have my passport inspected, I realized Yiwu was a bit on the border of the Chinese Wild Wild West. When I arrived at the Best Western that I had booked, I discovered that I had somehow made the reservation for the following week. Normally they would simply book me another room but apparently around Canton Fair time, nearly every room in the city books up. Thankfully I managed to find pretty much the last room in Yiwu at a budget Chinese hotel popular among Middle Eastern travelers for the abundance of Halal restaurants nearby. Middle Easterners aren’t the only people to travel to Yiwu. It truly is a United Nations of people- with Middle Easterners, Russians, and Africans appearing to be the dominating visitors .If you go to Yiwu, I strongly encourage you to find a street-side seat at one of the restaurants near Exotic Street and count the number of languages and cultural dress you see and hear (ask the taxi driver to take you to the only McDonalds in the city if you have any problems explaining to him where you’re going). What Products are at Yiwu? The scale of the Wholesale market is nearly unimaginable. The wholesale market was formed in the 70s and over time has grown to become 5 “districts” (which are basically twice the size of any large shopping mall you can think of) containing around 4000 shops each. To walk from the start to the end it will take you nearly an hour. In reality, you’ll need the better part of a day to really navigate the market. If you’re buying many items, you’ll need at least 2-3 days. It’s important to remember that Yiwu’s slogan is “A city of small commodities”. In relation to Yiwu, a commodity is basically any relatively inexpensive, non-technical, mass-market item. Things like stationary, Christmas decorations, picture frames, tourist gifts, suitcases, bags, and this type of thing. If you’re looking for the next top of the line cutting edge solar product, Yiwu probably isn’t your place. Often us Western people forget that the majority of people buying from China are not Western and are not from developed countries. Yiwu’s shop owners are trying to be everything to everyone – and it doesn’t matter which God you pray to, everyone needs padlocks and keychains. So remember, if you’re looking for a relatively limited appeal item, soccer balls are about as niche of an item as Yiwu will offer. For non-commodity items targeting various niches (i.e. automotive products, kitchen faucets, etc.) shows like the Canton Fair are a much better option than Yiwu. The market has almost every single commodity you can think of. There’s an entire floor for padlocks alone, an entire district is dedicated to jewelry, and hundreds of shops for stationary. Remember, there’s over 40,000 shops! From my readings on the internet I knew the scale of the market was huge and I also knew that I had limited time so I decided to get a guide for the day. Search Google for “Yiwu guide” and you’ll discover there’s no shortage of guides. Almost all guides are free with the hope you will buy some products from the shops at some point and the guide’s company will take a 2-5% commission. Clearly I had been hanging out at trade shows and in the touristy sections of Beijing and Shanghai too often, as I assumed everyone spoke some basic English. Not so at the market. Very few shop owners spoke any English. More so, the market is HUGE . You need someone to know exactly where to go to find particular items and that navigator is your guide (or Marco Polo as I referred to one of my guides!). I’m not exaggerating when I say that a naive foreigner visiting every shop could take the better part of a month. However, the last point in the list above is especially important. The normal strategy for the market is to tour the market with your guide. Along the way you get shown countless products. Your guide(s) make detailed note, take pictures of products, make measurements and most importantly, record the prices. Later, your guide sends you all this information and you basically give them a shopping list of what you want, i.e. “Hi Jessica, I’ll take 100 pieces of the key chains, 50 pieces of the dog beds, and 75 pieces of the pillows”. Your guide then contacts all of those Suppliers, makes payment and consolidates all of the products into one convenient shipment. All of this is next to almost impossible to do without a guide. The shop owners were surprisingly not pushy at all. You were free to walk in and browse without being hassled to any serious degree (the fact that few of them spoke English makes aggressive selling difficult I guess!). Each item conveniently lists the case pack number and the case dimensions. You must ask for prices and they’re relatively fixed. Even if you’re buying a container of goods, you can expect a 5-10% discount at most. Prices are quoted in RMB and with shipment terms EXW which is in contrast to the normal FOB quotations we normally get in USD. After touring the shops, your guide will send you a spreadsheet detailing all of the items you looked at- extremely helpful! Once you let your guide know what items you want and place a deposit, they will gather all of the goods for you in their centralized warehouse. They’ll do minimal quality control like ensuring counts and colors. They can also bar code ($0.50-$1USD per 100 labels approximately) and package your items according to your specifications which is especially good for Amazon FBA sellers. They will also arrange for shipment to your port. As my guides routinely let me know, they aim to be an all-in-one service provider including sourcing, quality control, prepping, and transportation. One of my guides recording vital information on a product to send to me later. 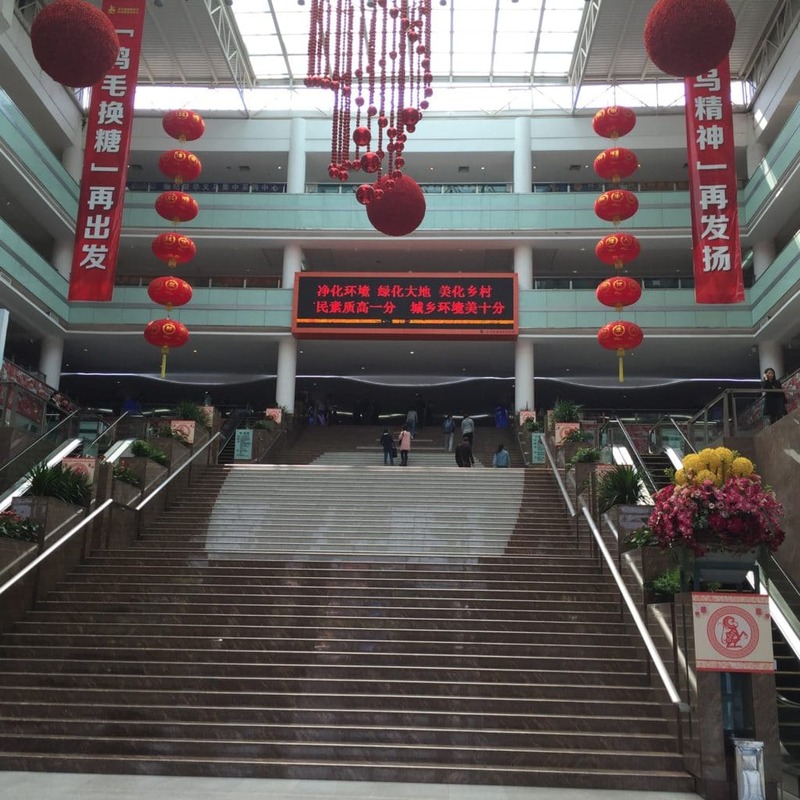 So what are advantages of Yiwu over going to the Canton Fair and/or shopping off Alibaba? Compared to the Canton Fair, easily the biggest advantage is the small order quantities allowed. In my hours of shopping to dozens of shop owners, I was never quoted more than 50 pieces for an MOQ. At the Canton fair you need to add at least 0ne or two zeros to that number. Also, with Yiwu the normal buying strategy is to buy several products from several shops. As per my guide, it’s not uncommon for a Buyer to purchase from 50 different shops and have them all shipped together in one shipment. With Alibaba, you may be able to buy a few pieces from a single buyer but you can’t buy multiple items from multiple buyers (at least not as easily as Yiwu). These facts make it extremely popular with smaller chain stores. For chain stores like Dollar Stars or Corner Stores, it’s a no brainer – I would go to Yiwu and buy all of my products from here. The biggest disadvantage to Yiwu is that it is focused purely on mass-market commodities. Things like soccer balls, pencils, jewelry, etc. Finding more niche items is very difficult. Most successful people I know selling online are selling more niche items, and Yiwu is probably a poor fit for them, myself included. I had a list of a couple of niche items I had given my guides beforehand and unsurprisingly they were nowhere to be found. For high quality, high quantity items, trade shows and/or dealing direct with factories is definitely the way to go. If you’re running a website, some of the items here could make good add-on items. For example, my company has some decorative bottle openers we throw in for orders over a certain amount- this is a perfect Yiwu item. Most of the items also tend to be so ‘cheap’ (I use this with both meanings of the word) that they probably would not make great standalone, home-run Amazon products. However, case packing many items together, i.e. a set of 10 bracelets, or bundling with other products, could potentially result in some profitable Amazon items. As I alluded to, the items at Yiwu tend to skew towards the low quality side (again, think dollar store items). Quality isn’t always critical for commodities though, such as the bottle openers we import and I’m sure with enough hunting you could find reasonable enough quality products. Visiting Yiwu confirms the sheer scale of Chinese manufacturing. The wholesale market is staggering in its size! No other country besides China could have a wholesale market like Yiwu and barely be on the radar of most importers. Yiwu isn’t going to be a haven of products for some people or maybe even most people. But any buyer who currently buys or will buy cheap commodities could definitely make a small fortune, especially compared to buying the same products from distributors and other middle men locally. If you’re unsure if Yiwu has products you may be looking for, reach out to a guide and they’ll often be happy to let you know before you make the trip to Yiwu, free of charge. The market is a fair distance from Guangzhou and Beijing, however, it is under 2 hours from Shanghai. If you’re in the Shanghai area and you have a day or two to kill, it’s definitely worth the trip as for some buyers it will definitely have a lot of potential. Yiwu is about 2 hours west of Shanghai and this is the route most people arrive from. Very conveniently, there’s now a high speed train linking Shanghai to Yiwu in 1:44. The cost of a 1st class train ticket is 200RMB (around $35US) and it leaves from Hongqiao Train Station in Shanghai (right beside Hongqiao airport which is almost certainly NOT the airport you arrived at – it’s on the other side of the city). You can reserve your ticket through C-Trip.com (they’ll charge a 20RMB service fee). However, you will have to still pick up your ticket at the train station using the reservation code you get through C-Trip. Expect to wait at least 20 minutes in line waiting to pick up your tickets so plan accordingly. The market is open nearly every day, 9-5, barring major Chinese Holidays. Order times can get pro-longed to 45-60 days preceding the Spring/Fall sessions of the Canton Fair opposed to the normal 30 day lead time other wise. The guides I used while in Yiwu were Estela, Jessica, and Frank from Partner Yiwu. You can contact Estela at [email protected]. Their website is Yiwu-Partner.com. I will go to Yiwu on 5th March, want import cheap watches and resell on my website. any guides for me? well i'm planning to visit china for starting up my own business. Though i do not have any specific product in mind ..should i visit yiwu ? n i even plan to be a merchant importer...will this trip be fruitful? hope u share your insight with me. Probably not - Yiwu does not have a lot of apparel especially higher ticket items.